Penllergare is featured regularly in local and national news. Find the latest newspaper cutting or website article here. 19 February 2015. South Wales Evening Post. Funding bit for beauty spot project’s next phase. 21st November 2014. South Wales Evening Post. Enterprise Winners. 1st November 2014. Blog. Fungi Foray at Penllergare. 4th September 2014. South Wales Evening Post. Milestone as lake rebirth is concluded. 10th August 2014. South Wales Evening Post. Work to restore a 19th century observatory at Penllergare Valley Woods continues to move forward. 7th July 2014. BBC News. Penllergare Valley Woods restoration starts on lake. 23rd June 2014. HomeAway Blog. Sun, Sea, Swansea. 2nd June 2014. BBC News. Penllergare Valley Woods observatory to be restored. 2nd June 2014. Western Mail. Tourism push for north Swansea after global praise for Gower beaches. 30th May 2014. South Wales Evening Post. Businesses swot up on wonders of rural Swansea. 20th May 2014. South Wales Evening Post. 100 pupils from a Swansea school have put time and effort into opening up a beauty spot for the community. John Dillwyn Llewelyn. The Valleys Heroes. 22nd April 2014. South Wales Evening Post. Observatory restoration work gets underway in Swansea. 3rd April 2014. South Wales Evening Post. Bridge to the past at revamped wood. 27th March 2014. South Wales Evening Post. Want to be a ranger? 19th March 2014. The Telegraph. The Welsh sheriff who pioneered photography. 20th December 2013. Daily Express. Restored Penllergare Valley Woods ideal for Christmas walks. 17th December. South Wales Evening Post. Christmas Present for Eels at former Country Estate. 26th November 2013. South Wales Evening Post. Ancient Greeks help out with restoration of Penllergare Valley Woods. 16th October 2013. South Wales Evening Post. Taking an in depth look at city’s lost buildings. 8th October 2013. South Wales Evening Post. New centre to welcome visitors. 26th September 2013. South Wales Evening Post. Park steeped in Swansea’s history gets historic park status. 25th September 2013. South Wales Evening Post. Farm staff saddle up. 5th September 2013. South Wales Evening Post. Volunteers help to resurrect old estate. 7th August 2013. South Wales Evening Post. Swansea lake is set for electric scheme. 9th July 2013. South Wales Evening Post. Clean up helpers praised. 12 April 2013. South Wales Evening Post. Penllergare Trust and Swansea Council team up to preserve woods. 12 April 2013. City and County of Swansea Press Release. Agreement signed to help restore Penllergare Valley Woods. 11 April 2013. Western Mail. Dylan Thomas’s favourite childhood park among seven in Wales to share £4.5m boost. 10 April 2013. Opodo. Welsh gardens to be revamped. 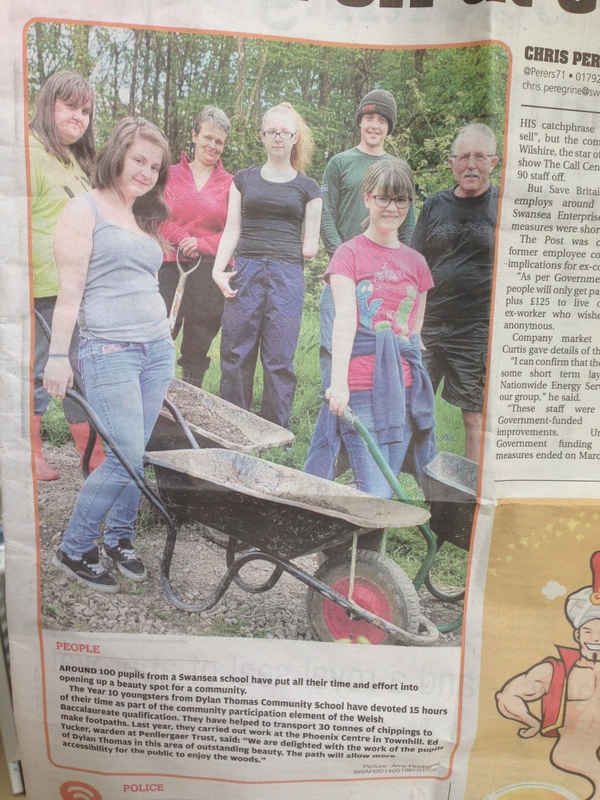 28 March 2013: South Wales Evening Post. Awards honour green groups.